This post is aimed to help our audience grasp a better understanding of the concepts behind 8x Protocol. I have attempted to write towards the wider audience by including clarifications and diagrams while also allowing those who are interested in understanding it more deeply to do so through links and code references. In this article, I will be answering the common question above by taking a closer look into how the system operates as well as introducing some economics concepts that will be apparent in the 8x Protocol ecosystem. Subscription consumers (individuals who want to make repeating payments with cryptocurrencies) — “subscribers” interact with the subscription contracts through interfaces (front-end). The MVP for this will be launched as a web portal in which businesses will redirect or integrate into their payment process when consumers opt into subscription plans. Note that consumers pay their subscriptions with the currency specified by the plan creator (not 8x tokens). Service Node Operators(8x Repeaters) — this group is an integral part of the ecosystem, their role is to process scheduled transactions (by calling the smart contract at the time it is due) and earn a fee by doing so. This introduces the 8x Token. Unlike most systems, the service node operators are not rewarded in 8x Tokens for processing a transaction. The reward amount is determined as a percentage set by the subscription creator and in the same currency set in the subscription plan. 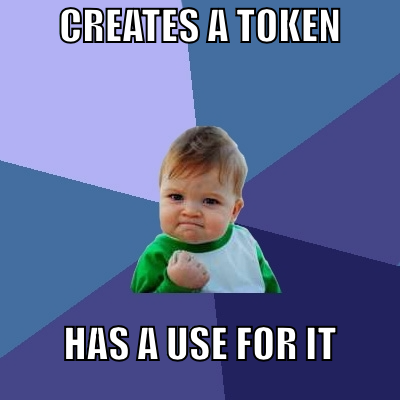 In order for service nodes to be eligible to process a subscription transaction they are required to stake 8x Tokens (lock up a certain amount of 8x Tokens for processing rights) the staking of the tokens then also act as collateral in the event that the operators fails to process the transaction on time or performs a malicious action. In the event that they do fail to process the transaction on time, their staked tokens are slashed and given to the next 8x Repeater who successfully processes the missed transaction. Below is the code snippet that allows 8x Repeaters to catch out missed transactions, this concept introduces an interesting aspect to the game theory of the 8x Protocol economy. However consider the scenario we have two individuals — Bob and Alice. They both have the opportunity to earn 5 Ethers, in attempting to do they both need to spend 2.5 Ethers* in fees. 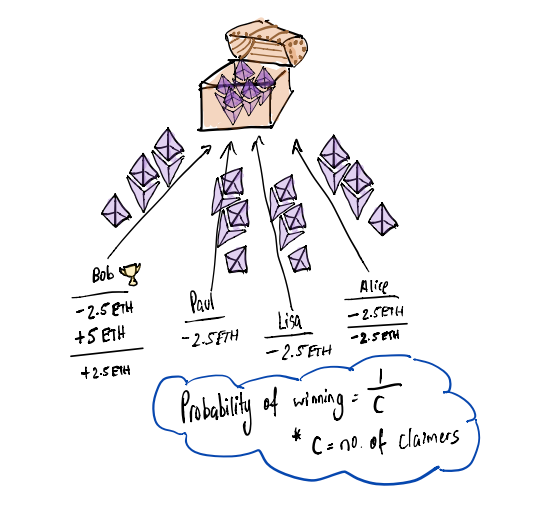 Now it is clear that they both have an equal (50%) chance of winning the prize of 5 ETH, let’s say Bob claims the prize and he is 2.5 ETH richer but Alice is now at a loss of 2.5ETH. *Note: The transaction fees are not this expensive, this is just for example purposes. This is fair game as they cost of participating is equal to the amount they can earn, however as more participants — such as Paul and Lisa — join the contest, the probability of earning the prize becomes increasingly small. Economics state that at the point where an individuals’ risk is greater than the probability that an individual is going to be rewarded, an individual would not participate in the game and that is exactly what happens in the claiming of subscription contracts in 8x Protocol. Supply — amount of unlocked (not staked) 8x Tokens held by the 8x repeaters. Demand — amount of subscription contracts that are unclaimed on the market (not being processed by 8x Repeaters). 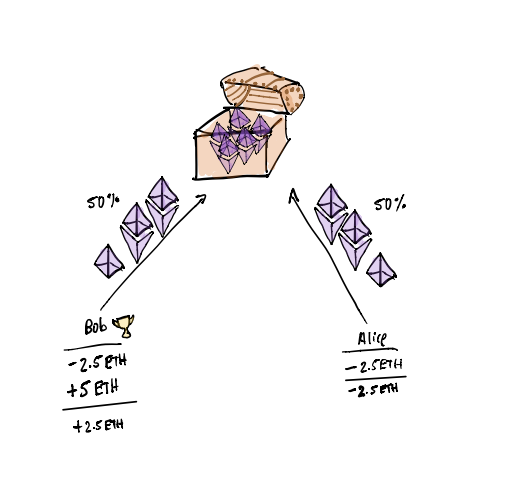 One important thing to note is that we did consider using Ethereum as a basis of setting the multiplier however both the monetary policy (inflation) and the uncertainty of Ethereum distribution among users would provide difficulty for figuring out the multiplier for the 8x Protocol system. The claiming problem exist mainly in the scenario that supply is greater than demand (where there are more free tokens than there are subscriptions to process). This results in a large amount of individuals fighting for each subscription contract (this is commonly labeled as the “gas war”). Gas is the fee of performing operations on Ethereum — this fee can be increased by the user in order to further incentivise miners to accept the operation before they accept other parties, this usually results in individuals attempting to fight each other by paying exceedingly high fees in the “war”. To prevent the conflicts that occur during this scenario, a multiplier would be set in place that reduces the amount of individuals who are eligible to process the subscription contract (a multiplier of 10x will mean you need 10 tokens staked per $1 value of subscription contract). Simply put the higher the multiplier the less conflicts would occur due to the reduced amount of individuals that are able to process the subscription. The above statement and concept assumes that there will be never exist a scenario that individuals hold the same number of tokens. This is highly likely due to the historic distribution of currency amongst different economies which show that the distribution (power law distribution) of currency is never even (there exist a small percentage of individuals who hold the majority of the circulating supply). If the number of unlocked tokens is less than the amount of subscriptions waiting to be processed, a backlog of contracts begins to form. By reaching this point, the economy of 8x Protocol would be well developed, businesses would automatically start to incentivise the 8x Repeaters to process their transactions first by setting higher rewards for them to earn. On the 8x Protocol side, the multiplier could also be set at a lower rate in order to free up tokens that were once staked (e.g setting the multiplier from 1x to 0.5x would free up 0.5 tokens per dollar value) and thus allow the freed-up tokens to be used to process other subscriptions in the backlog. Apparent in both scenarios above, the introduction of the 8x Token multiplier is an essential part of the 8x Protocol economy. Readjusting the multiplier enables us to respond to the market in different ways in order to provide a fair and incentivised economy for the 8x Repeaters to operate in. I hope through the detailed scenarios and examples above that I have successfully explained the reasoning behind the 8x Token. While reading this article, I assume that you would have a better understanding of how the 8x Repeaters operate and remain incentivised. On the ending note, we are currently looking for MVP testers for the 8x Protocol both implementing it in their service/business or project and also for individuals to test the UX of our designs. Please free feel to reach me at andy@8xprotocol.com or dropping by our telegram (link below) if you are interested in discussing this article or the request above. 8x is a protocol for facilitating recurring crypto payments without exposing consumers or businesses to the volatility of crypto currencies. Front-end developer #buidling decentralized products.